OSHIOMHOLE-IVGovernor Adams Oshiomhole of Edo State is getting married today , Friday May 15 at Auchi. The 63-year old governor is getting married to a 30-something year old Ethiopian lady, Iara Fortez. Mr. Oshiomhole’s first wife, Clara Oshiomhole, died 5 years ago in December 2010, after a long fight with cancer. She was 54 years old. Clara was the initiator of the Health Foundation for Maternal and Child Care, – a project aimed at providing healthcare for pregnant women and female children. “Any woman who agrees to marry a man who is not rich, a man who alternates between police stations and cells and lives in a one or two bedroom apartment that is your real love. All roads lead to the the Etsako West Local Government Council Marriage Registry, Auchi on Friday as Governor of Edo state, Adams Oshiomhole, takes a new wife. 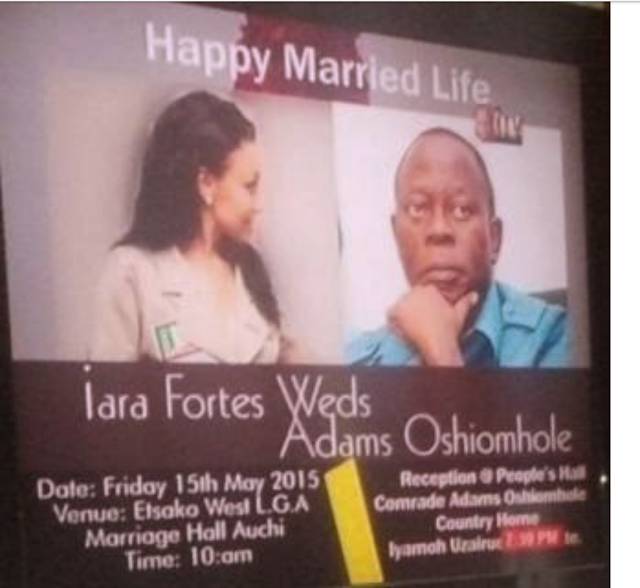 Oshiomhole is remarrying four years after the death of his first wife, Clara. The bride is Ethiopian-born Miss Lara Fortes, a model and former air hostess. Already, wedding invitations have been sent by the governor to select close friends and associates. The reception, according to the invitation which was personally signed by Oshiomhole himself, will hold at the Peoples’ Hall, Iyamho, the governor’s country home. “While looking forward to the honour of your distinguished presence, I sincerely crave your pardon for the rather short notice. Please accept the renewed assurances of my highest esteem,” Oshiomhole wrote in the invitation. 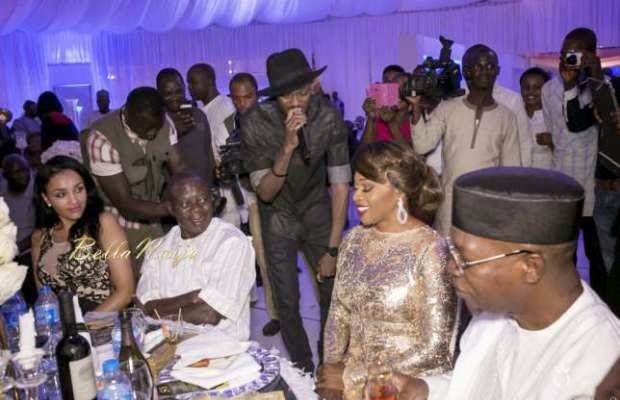 The bride who is in her 30s was earlier seen with Oshiomhole who is 63 year old at the 50th birthday party of Grace Ihonvbere, wife of Secretary to the Edo State Government, Julius Ihonvbere, on March 21 in Abuja. Oshiomhole’s first wife, Clara, died of cancer on 8 December, 2010. Other prominent Nigerians married to foreigners are: Anselmn Madubuko, Pastor of Revival Assembly Ministries International, Ogba, who married Kenyan singer, Emmy Kosgey after the death of his first wife, Connie, who bore him three children. Connie died on Friday, July 6, 2012. Pastor Taiwo Odukoya, presiding pastor of Fountain of Life Church also married a South African, Nomthi, after the death of his first wife, Bimbo. Popular Nollywood actor Ramson Noah is married to a Beninois while former External Affairs Minister, Professor Bolaji Akinyemi is married to a Briton. Popular highlife musician Orlando Julius is married to a black American, so also is punk star Charly Boy who is married to a black American. Esama of Benin, Sir Gabriel Osawaru Igbinedion is married to a Carribean, Lady Cherry. One of King Sunny Ade’s wives, Ahneva, is also a black American. One of the Ibru siblings, Oboden Ibru, is married to an Ethiopian. Sunday Oliseh former Captain of the Super Eagles is married to a Tunisian. his first wife Clara died of cancer aged 54.